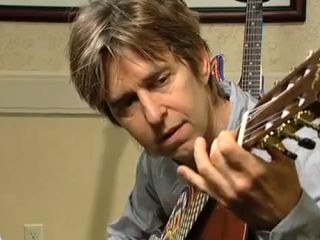 Eric Johnson has good news for his fans across the globe. "My new album is finally finished," the Grammy Award-winning guitarist tells MusicRadar. "It's called Up Close, and I'm looking to release it in the middle of October. There's the chance it could be held for a month or two, but I'm hoping for October. It turned out great. It's definitely a step in the right direction." Before mounting a tour to promote Up Close, the guitarist is going to hit the road with Andy McKee and Peppino D'Agostino for the all-acoustic Guitar Masters tour. The 21-date, two-leg run of theaters, colleges and clubs (US dates only, so far) will feature individual sets by each capped with a finale where all three interplay and collaborate for the first time together. McKee is an Internet phenomenon whose solo acoustic six-string performance videos have racked up an astounding 78 million-plus plays on YouTube, where he has also held the three Top-Rated Videos of All Time. His creative and innovative use of altered tunings, syncopated rhythm guitar taps, partial capos and his textural use of polyphonic tones are showcased on his six critically-lauded independent albums. Native Italian steel-string player Peppino D'Agostino, who now resides in the San Francisco Bay area, has numerous releases to his credit, including collaborations with electric rock guitar star Stef Burns and classical guitar expert David Tanenbaum. Johnson has played shows with D'Agostino in the past, but this will be the first time he's performed with McKee. The two guitarists haven't even met yet. But Johnson is a fan of the man's work. "Andy is a great player who puts all this guitar technique into songs he writes and plays that make them quite interesting," he says. "But it's still all about the song." MusicRadar sat down with Johnson to talk about the Guitar Masters tour, which will be briefly interrupted by his participation in the fall run of the Experience Hendrix tour. So there's been a little confusion as to the name of the tour. I've seen Guitar Masters as one title, then I saw Guitar Masters Acoustic as another. [laughs] "Yeah, it's a funny kind of title, no matter what you call it. The whole 'Guitar Masters' thing scares me a little bit, because it makes me think about Segovia and Paco de Lucia - you know, the real masters. I hope people aren't let down when they see it's just us three guys." "No, I'm confident that the people will enjoy what we do. But you know, you don't want to build these things up too much." How did the whole tour come about? Now, you and Peppino have done some touring before, but this will be your first time meeting, let alone playing with, Andy. "Yeah, Peppino and I have done some stuff together. He's an amazing player, of course. He's the coolest. And I've been checking Andy's stuff out on You Tube - he's become quite popular. I think it was a good idea to put the three of us together on one bill. We come from different places musically, but we share the same passion for music and playing the acoustic guitar. It's going to be real cool." In a way, this sounds like an acoustic version of the G3 tour - which you yourself have been part of. "Yeah, it could be viewed like that. I think of it as more of a college listening tour instead of a big concert thing. To me, the acoustic guitar is the star more than we are." What's the setup of the program? From what I understand, you're each going to do individual sets, then come out and play together. "Pretty much. I might play a couple of piano pieces, as well, which I usually do at acoustic shows - I like to break it up like that. "As far as the guitar songs I'm going to do, I've written a few new things - you might hear a new one, hopefully. I'm actually trying to do an acoustic album. I've already recorded three cuts, and I have about ten more that I need to get to. They're kind of like folk songs, I guess. I'll probably perform some cover tunes, too, maybe some Simon & Garfunkel songs - Scarborough Fair is a big favorite of mine. "I'll also do acoustic versions of some of my older songs, like A Tribute To Jerry Reed, stuff like that. I'm still figuring it out, but I know I don't have much time to get a setlist together." "When it comes down to performing together at the end, we'll probably mix it up and do some songs by each guy. We might even try to do a medley of some of our music. I do have a new song called On The Way from the Up Close album that I'm going to see if we can try. It's kind of a country-bluegrass number, so it could lend itself to being played on acoustics." Andy McKee has said in interviews that your song Cliffs Of Dover inspired him to play the guitar. That's got to be an amazing feeling. "Yeah, it is. I don't even know how to respond when I hear something like that. I'm flattered, of course - what an incredible thing. But he sure took what I do and brought it to a new realm. He really pushes himself, which I find very inspiring." What guitars will you be bringing out with you? "I'll bring out my Martin, definitely. I have a Signature Edition, which is a great honor, of course. It's a fabulous guitar and does just about everything I could want from an acoustic. I'll probably also bring a PRS acoustic out with me. That's about it. It's not like I have to bring a ton of guitars." It's kind of a weird tour, in a way, because you start in early October, go till the end of that month. Then it picks up again in mid-January. Between that time, however, you're heading back for another run with the Experience Hendrix tour.